Monday–Friday, 8:00 a.m. - 3:00 p.m.
Center Hours: Monday-Friday, 8:00 a.m. - 4:30 p.m., evening and weekend hours vary. Keep the Park Avenue Community Center in mind for your next event. Located in downtown Escondido, this beautiful remodeled facility is perfect for your next meeting, party, seminar, training, or special event. 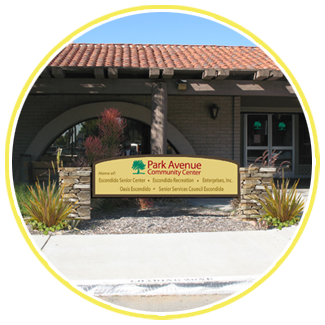 Please call the Park Avenue Community Center at 760-839-4688 to discuss your upcoming event. For more information on the Park Avenue Community Center, please visit www.escondido.org/escondido-senior-center.aspx.